I'm always rooting for troubled titles to right themselves, so I'm very pleased that Jeff Parker's Aquaman Vol. 6: Maelstrom, his second and final volume of the title, ends very strongly. Parker's first volume was a hodgepodge, and Maelstrom shows early signs of similar trouble, but the tone shifts with the "Maelstrom" story proper and the book's quality considerably improves from there. Parker takes Aquaman on a short tour of the DC Universe including some surprising guest stars, unexpected locations, and revelations that change the Aquaman mythos but good. Maelstrom is a high note for Parker to go out on. Maelstrom's first three chapters see Aquaman battling Chimera, a crazed man-turned-sea-monster. This is already an improvement over the "villains" in Parker's Aquaman Vol. 5: Sea of Storms, mostly nameless monsters with no real connection to Aquaman (including, absurdly, the mythological Hercules). Alternatively Chimera, in his madness, blames Aquaman for his bizarre condition, while also possessing half the brain of a monster loyal to Atlantean royalty, making for some mixed priorities on Chimera's part. Additionally, Chimera's power to control sea life bests Aquaman's, such to make Aquaman more vulnerable in the water and not less. The latter point is not only legitimately frightening -- imagine Aquaman swarmed unrelentingly by sharks -- but also explores a facet of the character we ordinarily take for granted, connections that were missing in Parker's previous stories. At the same time, the Chimera story initially made me think Maelstrom would follow Sea of Storms's path. Aquaman and Chimera's fight is essentially three issues long, and while there's a handful of subplots along the way, I found the story a bit padded with senseless action, especially once the fight moves almost entirely to land. (I don't believe every Aquaman story must contain water, as when a body of water is shoehorned into this or that Justice League story, but when Aquaman throws down with a monster in the middle of a city, it could at that point as soon be Superman.) Also series artist Paul Pelletier only draws the first two chapters and then hands over art duties to Carlos Rodriguez for the third, and the lack of detail in Rodriguez's work versus Pelletier's confident drawing takes a lot of wind out of the story's climax. Pelletier returns strong, however, for the six-issue "Maelstrom," and immediately it's as if Aquaman has finally clicked for Parker. From the outset, there's a variety of intriguing things going on, from Aquaman assembling a forensic "dream team" to solve a very specific mystery in Atlantis, to Aquaman's creative way of punishing a group of Atlantean rebels, to the first part's final game-changing revelation. The story is relevant, and because it hinges on more than just good guys versus bad guys, there's real suspense as to how it will turn out; also Parker and Pelletier tease out a procedural mystery with aplomb, wonderfully set against an undersea backdrop. Arguably, Parker vamps a bit too long in "Maelstrom," the same as elsewhere; on the other hand, it provides the opportunity first for a Martian Manhunter team-up and second for Aquaman and Mera to visit Gorilla City, complete with the requisite Gorilla Grodd battle. Each of these issues are well done, and despite that there's only two of them, they add a "road trip" feel to the "Maelstrom" story. Each chapter made me want to read more -- another Aquaman/Manhunter team up (considerably improved from the Wonder Woman and Swamp Thing team-ups) and another issue that details Aquaman's first visit to Gorilla City. The big revelation, of course, is that Aquaman's mother is not dead, but instead rules the remote land of Pacifica. This is obviously origin-changing stuff for Aquaman, and Parker doles it out well; that Aquaman and Atlanna don't have an immediate emotional reunion -- she tries to kill him -- lets her presence sink in gradually. I also very much enjoyed Parker's callback to Mera's Secret Origins story included here, and how the revelations about Atlanna's "death" actually creates new similarities between Aquaman and Mera. Aquaman and Titans fans know that Atlanna faking her death to help the purple-eyed Atlanteans also has big ramifications for the Aquaman title. The conclusion of "Maelstorm" and its complex, multi-sided final battle suggests the kind of complexity I've been hoping for from Parker's Aquaman all along, and the happy pre-Convergence ending is just the right note to go out on. Aquaman Vol. 6: Maelstrom does make use of everything set up in Jeff Parker's Sea of Storms, possibly redeeming that book a little (though not most of the Hercules stuff). 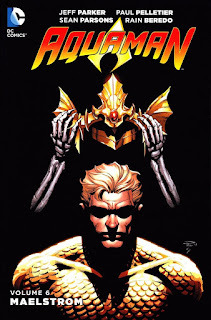 I'll be curious to see what Cullen Bunn and Dan Abnett keep; there's certainly some threads Parker has left hanging with the undersea Triton base, letting alone whether Ocean Master will ever learn the truth about his mother Atlanna or if she and Aquaman will meet again. Though unfortunately burdened by the issues that come before, "Maelstrom" is a good Aquaman story, worthy reading secondary to the Throne of Atlantis and Death of a King epics. I totally enjoyed the Parker/Pelletier AQUAMAN run. Loved that King Arthur is well respected in Gorilla City. MAELSTROM is definitely worth your time. Yeah, I want to know more about that first Gorilla City adventure! Aquaman was one of those titles that actually stayed consistently good (outside of maybe Bunn's run).